Ad Reinhardt, detail of scrapbook page, ca. 1934. Courtesy of Smithsonian Archives of American Art. The American abstract expressionist painter Adolph Dietrich Friedrich Reinhardt, who died in 1967 at the age of 54, is remembered as a staunch minimalist, an outspoken polemicist, and an unequivocal purist. ("Art is art," he once said. "Everything else is everything else.") For the last twelve years of his life, he worked almost exclusively in black, producing a series of stark, monochromatic paintings  nothingness art, as it is sometimes called  devoid of meaning, stripped of evident associations. 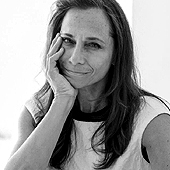 But prior to these years of devout reductivism was a quarter-century of eclecticism, a flurry of activity borne of the kind of fundamental uncertainty that characterizes all young makers. Reinhardt fretted about the meaning of life. He agonized about the purpose of painting. He questioned everyone, critiqued everything, and worked incessantly. In other words, he was a graphic designer. Ad Reinhardt, "Please Teach Me To Draw Like You." 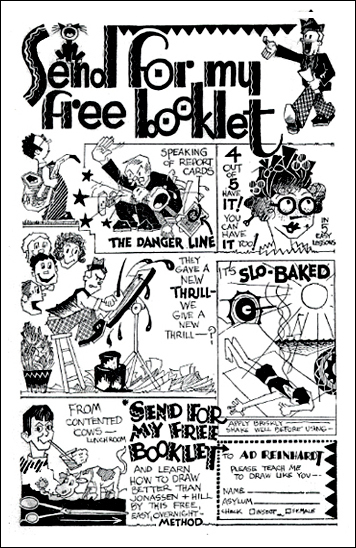 Comic strip, early 1930s. Courtesy of Smithsonian Archives of American Art. But Reinhardt's interest was in words as well as in pictures. As the editor of Columbia's undergraduate magazine, The Jester, Reinhardt was responsible for, among other things, its redesign. (He critiqued the existing magazine for being "moribund" and vowed, under his leadership, to make the new magazine "satirical, sophisticated and screwy.") Within two years of graduating, he was experimenting with cubism, calligraphy and collage. By the late 1930s, Reinhardt had found employment with the WPA Federal Art Project, and for a period in the early 1940s, as a freelance writer and graphic artist. Here, an undated ad for BBDO shows a series of goofy faces, and includes the artist's signature, suggesting that long before he would jettison such methods, Reinhardt experimented with them, with varying degrees of humor, clumsiness, and indeed  success. Detail from a signed, undated advertisement by BBDO for The Saturday Evening Post. Courtesy of Smithsonian Archives of American Art. Reinhardt's influence as a writer and teacher paralleled his prolific studio life, and it is likely that his painting benefited from the kind of inquiry and scrutiny he pursued in the classroom. As a teacher of art history at Brooklyn College for two decades  a period in which his own painting progressed rapidly toward the minimalist reduction for which he is best remembered  he also found time to design posters. Combining found imagery, collage and a playful amalgamation of ransom-style letterforms, Reinhardt's broadsides are whimsical and goofy, and about as far from minimalism as you can get. 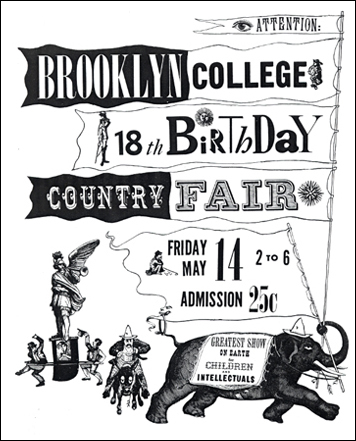 Ad Reinhardt, poster for the Brooklyn College Country Fair, 1948. Courtesy of Smithsonian Archives of American Art. Throughout his comparatively brief life, Ad Reinhardt was a prodigious maker. He traveled frequently to Asia, wrote essays and criticism, and painted furiously. But he also drew cartoons. He designed magazines, posters and typefaces. He made illustrations, building a small but not insignificant body of work that, by all accounts, provided an alternate source of entertainment and exasperation. How, for example, could a "picture" artist be a real artist? Illustrations by Ad Reinhardt, undated. Courtesy of Smithsonian Archives of American Art. What's particularly fascinating is that these were lifelong preoccupations. 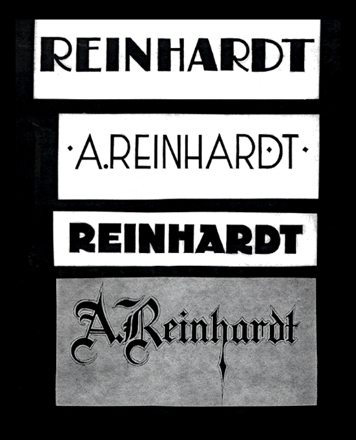 Reinhardt struggled to define art for himself as well as others  but so, too, did he wrestle with what it meant to make things, to address the bigger picture. As a high school student, he was already imploring his classmates to ask themselves the tough questions. "The world needs students who are realists, fixing their gaze on what is near," he wrote in an editorial in his high school newspaper. "But far more does it need idealists  dreamers, architects of air castles." Excellent questions for graphic designers. Even today. Reinhardt's always been one of my favorite cranky old men. He was an amazing cartoonist, letterer and painter. He was even better as a thorn in the side of the "New York School". He was also a neighbor of the amazing Stuart Davis (an even bigger crank) who had a pretty big influence on his attitude. Thanks Jessica, I needed this one today. Michael, how many typefaces did he get away with on each of these pieces? thank you for this jessica. air castles built (or drawn) by hand. are we already too mediated? is it too late? i cannot think of the last air castle i've seen. i am now sad. peter, can you draw me an air castle please? Thank you Jessica, this is something I am very glad to see as well... 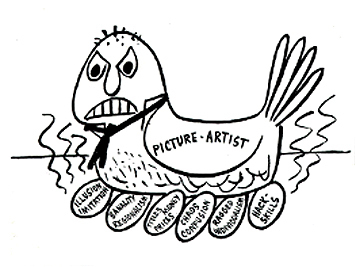 Ad Reinhardt is one of my favorite artists for both his wit and his work. Reinhardt was known for saying "Artists shouldn't be concerned with communication" so quite interesting seeing those typefaces. Thank you for sharing this. I've only known Ad Reinhardt as a painter. It's a revealation to see his "commercial work", and the lighthearted commentaries. 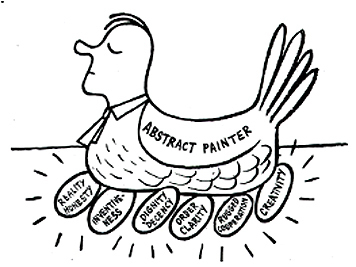 His "picture artist" ,"abstract painter" cartoons hold true today. Only now I think they can be applied to the split we find in the world of graphic design. There's a lot of judgement out there regarding what graphic design is art, and what is not. in many, ways much of ad reinhardt's art, work, life and times etc, hold more interest and worth (to myself and others), than many of his contemporaries and theirs -then what came after. as well as being a notable (yet perhaps maverick) figure "part of that scene", he often went beyond -and even now isn't quite as understood or exposed as he should be. its amasing the insight which can be gleaned from what was otherwise functional or even indifferent / base / indifferent hackwork -and the input and concerns of ad reinhardt going into it. 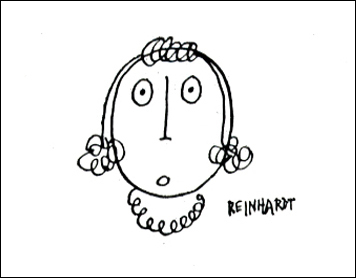 and of course, theres ad reinhardt's art and culture aphorisms, writings (commandments etc), cartoons, comic-strips, graphs and charts etc.